One of the most storied studio shows in sports history traveled to New York City. Sports Illustrated went inside the broadcast's control room. NEW YORK — Everything is different. First, there’s the strange location, a stretch on Broadway between West 43rd and West 44th Street in Manhattan, a setting where the locals are as likely to utter Securities and Exchange Commission when asked about the power of the SEC. Then there is this week’s control room. The show’s producers are used to working in a broadcast truck outside of the main campus set. Not today. On this late September morning in the college football hotbed known as Times Square, ESPN’s College GameDay production group has set up shop in a control room normally used by staffers for ABC’s Good Morning America. They are working a couple of floors above a crowd featuring fans wearing Rutgers and Fordham gear in addition to Florida State and Alabama. One cheeky GameDay sign says it all: “Worst TRL Ever,” referring to MTV’s iconic Total Request Live show which ran from 1998 to 2008 and had studios in Times Square. I spent the first hour of College GameDay on Saturday inside the control room to get a sense of what goes on behind the scenes for arguably the greatest sports studio show in history (Inside The NBA is No. 1 for me, but it’s all subjective.) It’s a massive operation, from the stage managers and crew working overnights to set up the staging, to the core production group. I’m sitting near lead producer Jim Gaiero, coordinating producer Drew Gallagher, director Rodney Perez, assistant director Jeff Dorsey and producer Aaron Katzman. Lee Fitting, now the vice president of production for the show who is now a senior coordinating producer for ESPN's college studio shows, is also here. About 40 minutes prior to the start of the show, which airs Saturdays from 9:00 a.m to noon ET, production staffers continue to set up shots that will air during the show. Lorenzo LaMadrid, a coordinating director for GameDay, spots a “Beat Julliard” sign in one of the windows on the control panel. He files it away as a clever sign they might want to air. The crowd that has assembled on Broadway for the 332rd edition of GameDay lacks the size of most on-campus audiences but there is more diversity of schools than you might expect. New York City has fan bases of most major schools and there’s a lot of Florida State and Alabama representation in the crowd. When you sit inside a control room at the highest levels of sports television, you really get a sense of how important the behind the scenes people are. Perez and his colleagues have to allow GameDay to feel spontaneous while also providing viewers with an impeccably produced show. Throughout the hour I’m there Perez is cutting all the time from four-wide shots (featuring four panelists) to two shots (two staffers) to crowd shots and back again. The graphics group, guided by the producers, readies up relevant data that will match the segments. For instance, after research producer Chris Fallica references Minnesota coach P.J. Fleck, the production cuts to a side by side graphic of Herbstreit and Fleck, who is wearing a similar sport coat to the one Herbstreit is wearing in New York. The crew reacts to the graphic. It’s a funny moment. Even within a well-produced show, issues always arise on live television. At one point in the first hour, Herbstreit tells Gaiero that he is having trouble hearing him because his talk-back piece was off. (The talk-back is the microphone broadcasters use communicate with the production truck.) It was a glitch from being in a different control room and the crew fixed it quickly. Gaiero, Gallagher and Perez are the only production people who speak directly to the on-air hosts as a way to control audio traffic. Prior to the show, Gallagher said the biggest production challenge was the smaller footprint GameDay had in Times Square. The production had much less space to work with than a typical campus show, so it was a challenge to stage things such as the mock football field. The setup was also completed a day later than usual given the unique setting. Gallagher said the GameDay episode airing from Fargo, North Dakota was the closest he could think of to New York in terms of a city atmosphere and the staging challenges. “The location and the setting is almost like a fifth person on the set, a character on the show, and this week New York amplifies that even more,” Gallagher said. The origins of GameDay coming to New York City go back five years ago or so. Chris Fowler, and Fowler’s wife, Jennifer Dempster, always advocated to Fitting that New York City had an immense number of college football fans given the sheer population size and alumni bases of some schools. I reached Fowler on Friday in Iowa City. He confirmed that it was something he and wife had pitched for some time. This week’s schedule provided the possibility of coming to New York City. While there were good games on the docket and obviously endless locations, there was no mega No 1 vs. No. 2-type of showdown. Gallagher said the decision was made shortly before the formal announcement on Sept. 14. Some have speculated, including very reputable media reporters such as John Ourand of Sports Business Journal, that GameDay was in New York City as a result of a carriage negotiations between Disney and New York-based cable operator Altice. The rhetoric between both sides has heated up as the contract is set to expire. The premise would be that ESPN wanted to highlight the valuable college programming Altice customers would be missing. ESPN executives knocked that thesis down this week, saying New York has been a potential destination for College GameDay for years. Perez was born in the Bronx so the Times Square show was a special one for him. At 9:40 a.m, ET viewers saw a hot dog vendor pumping out product to a group of college cheerleaders from local colleges. It was quintessential New York, a hot dog vendor slinging an iconic New York product. “I’m sorry but this is the funniest thing we’ll do today,” Perez said, with relish. Gaiero said he wished they could have had more handheld RF cameras (wireless cameras) with higher frequency capabilities to show people coming to the set as well as departing the set to head to the local bars for kickoff. (Basically they would need another truck to come in with separate uplink technology to grab those frequencies.) Gallagher said GameDay could have improved on documenting the sheer number of different colleges that are represented in the city. Both producers were well aware there would be criticism would the location choice—and there was on social media—but they clearly felt the decision was the right one. Gallagher said about 100 people work on GameDay includes production staffers back in Bristol such as production assistants, associate producers and editors who produced all the edited content and who integrate the show on Saturday morning). It works like this: The GameDay feed gets beamed back to Bristol where it gets integrated with live shots and noon game arrivals and warm-ups. The integrated show from Bristol is what gets sent to your living room. (The Chicago Tribune’s Teddy Greenstein followed the crew around for the weekend and filed this entertaining report. Upon watching the show on tape later on Saturday, it was impressive to see how seamless the show looked in the opening hour when there was some tension inside the control room. GameDay also pulled off a memorable kicker to the broadcast: Lee Corso in a Statue of Liberty costume, declaring New York a college football town. The show lacked scale when it came to the fans but that was always going to be the drawback compared to a college campus. 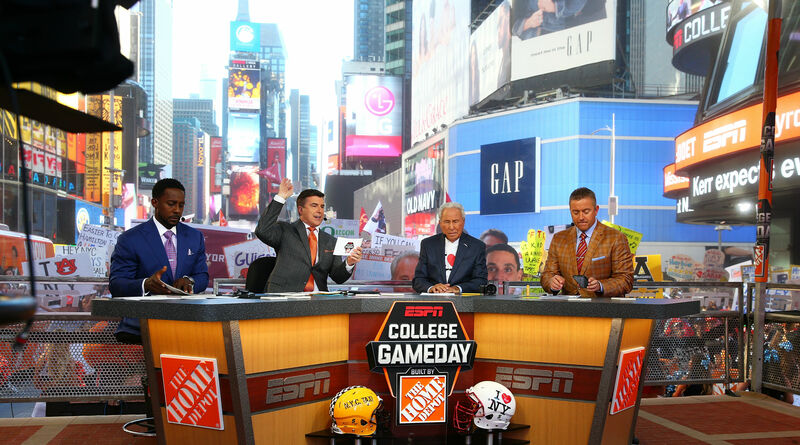 Will GameDay return to New York City? I’d imagine not. But it was a memorable experience for the crew and expanded the show’s footprint.